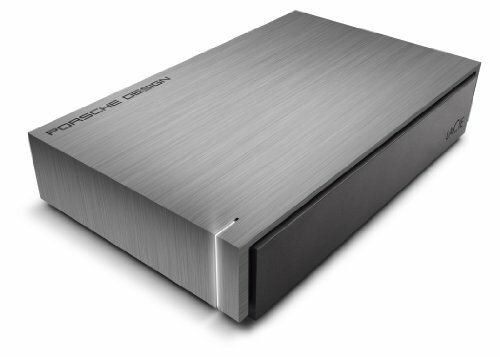 The Ultimate Blend of Design and Performance: The LaCie Porsche Design P'9230 is a new breed of desktop hard drive, a perfect blend of form and function. It's the product of a collaboration between one of the most renowned design firms in the world and LaCie. The P'9230 lets you transfer files faster than ever with USB 3.0 performance, and has the capacity to hold all of your files. It also features a striking LED that both indicates power and lends sophisticated elegance. With the P'9230's USB 3.0 interface, you'll be able to get the job done faster than you ever imagined-you can transfer a 700MB video file in just under 7 seconds! With USB 3.0 speed, you can back up your photos, videos, and music files, and even quickly exchange them with friends or colleagues-with minimal wait time. The P'9230 also protects your files with 5mm of aluminum casing surrounding the drive inside. This solid armor protects your data, gives the drive sophisticated substance, and even helps to dissipate heat. These properties help to protect the hard disk and prolong its lifespan. The P'9230 also comes with a software suite that makes for a user friendly experience that includes automated backups, password protection and an additional 10 GB of Wuala cloud storage for your most critical data. An automatic eco mode lowers the power consumption by up to 77% when not in use, increasing the battery life of your notebook or laptop. LaCie and Porsche Design worked together to combine form and function-resulting in a desktop hard drive that looks great on your desk (and works great).